Speed Skiing Champion, Jan Farrell, join Train Together! 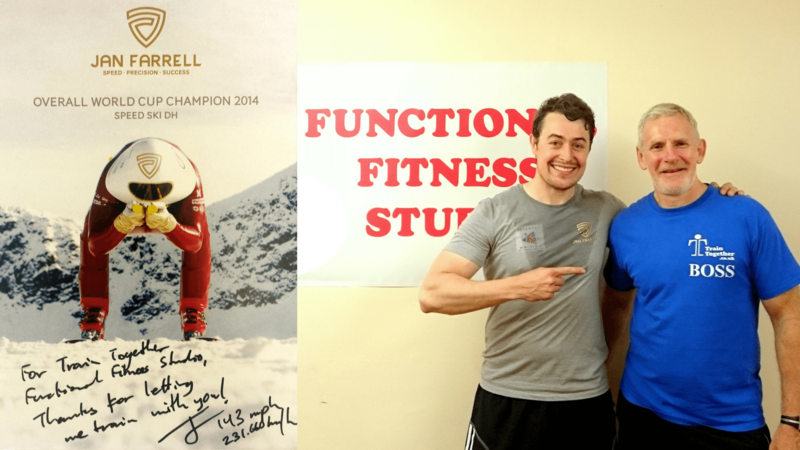 Jan Farrell, Speed Skiing Champion, Joins Train Together! Every week at Train Together something special happens, and this week is no different! Yesterday we welcomed a very special new member: Jan Farrell. If you love skiing like we do here at Train Together, you’ll know exactly who we are talking about. He’s an OVERALL WORLD CUP CHAMPION SPEED SKIER, born here in Lancaster. Reaching top speeds of 143mph (231.66kph) on skis, he is one of the fastest non-motorised people on the planet – not to mention Britain’s very own Downhill record holder. Read more about Jan, here. So, how did we come to find him training with us at Train Together? On a trip visiting family and friends, Jan Farrell was looking for the right gym to train – then he found us! We are very excited to see him training in our studio and love being a part of his incredible journey. His next goals include breaking a further 7 Guinness World Speed Records within the next 3 years. He also wants to take Speed Skiing a step forward in the media and bring it closer to the general public – so training with us and our lovely members, he’s managing to do just that (be sure to say hello to him when you’re next in the gym)! We have always said that Train Together is created for everyone, whatever your ability, age or gender. If you’re a top professional athlete like Jan Farrell or a complete newbie to the world of health and fitness, our Personal Trainers have exactly what it takes to give you the best start to your fitness journey. Join us today for a free week of unlimited classes, gym and boot camps (you might even brush shoulders with a World Cup Champion!). Contact us today at info@traintogether.co.uk or call us on 01524 389616 for more information. Jan Farrell is a really great guy, and it is a privilege to welcome him to the Train Together team!